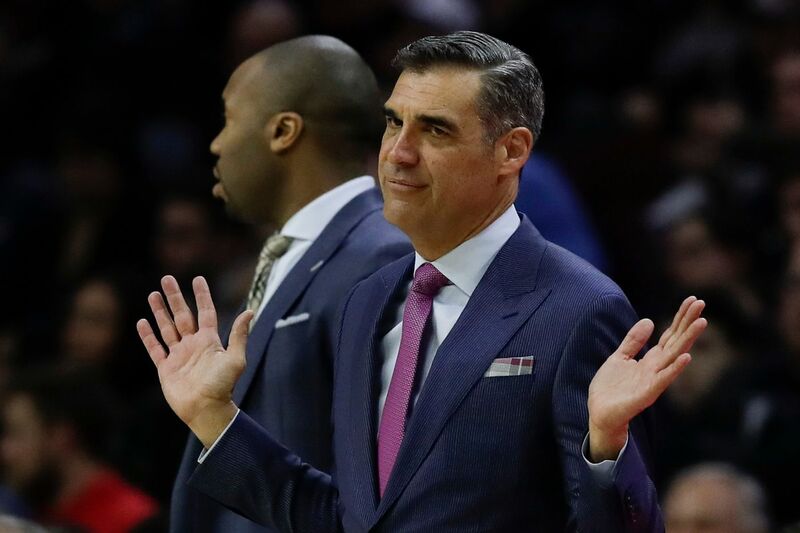 Villanova Head Coach Jay Wright raises his arms during the first-half against Seton Hall at the Wells Fargo Center on Sunday, January 27, 2019. This wasn’t expected to be an easy season for Villanova. The youthful Wildcats lost the top four scorers from their national championship team to the NBA, so another 30-win season and a deep NCAA run might have been too much to ask. However, with their first game in the Big East tournament right around the corner, the Wildcats continue to sputter despite the leadership and talent of their two senior leaders, Phil Booth and Eric Paschall. They concluded the regular season with a 40-minute uphill fight Saturday against Seton Hall that led to a 79-75 defeat. Thanks to a late swoon by Marquette, Villanova (22-9, 13-5) won the outright Big East championship for the fifth time in the last six years. Still, inconsistency and inefficiency continue to hamper the Cats, something that you figured would happen with three sophomore and four freshmen, but not this late in the season. “It’s just consistency, man,” Wright said Saturday after the game. “It’s been all year, just bringing it every night, bringing it defensively every night, bringing it in terms of executing every night. It’s not really complicated. It’s just that we just bring it at different levels every night. Asked at the start of every season about his team’s goals, Wright always gives the same answer: “To be the best team we can be by the end of the season.” The fact that the Wildcats won 22 games in the regular season after losing 70 percent of their scoring and 59 percent of their rebounding from their second title team in three years would appear to be a great achievement. However, the Cats started regressing late in an 11-game winning streak that included a 10-0 start in the Big East. Wright said he started seeing signs of “loose play” at both ends, and some ill-advised shot selection, in a Jan. 30 win at DePaul. They are 3-5 since the end of that run. With an aim toward getting his freshmen in the rotation, Wright tinkered with ways to get them ready. But only Saddiq Bey has been a consistent presence in the lineup, having started his last 15 games, and Wright conceded that maybe he went too long before settling on a rotation. Cole Swider had been the team’s eighth man until he broke his right (shooting) hand on Jan. 17 and has been sidelined since then. Jahvon Quinerly, the top-rated high school player in the 2018-19 class, has played one minute in the last three games. Brandon Slater has entered just 14 games. Phil Booth, center, of Villanova gets congratulated by Coach Jay Wright, left, and Dhamir Cosby-Roundtree after he forced a Butler turnover in the 2nd half. Villanova defeated Butler at the Wells Fargo Center on March 2, 2019. Wright has used a seven-man rotation in the last three games, getting them reps in practices and in competition to prepare the Cats for the postseason. The tinkering, he said, has stopped. Wright said all four freshmen “are going to be really good Villanova basketball players.” He said Quinerly and Slater “are going to be really good, but we just didn’t get them to where, at this point of the season, they were playing like veterans. Meanwhile, Booth and Paschall continue to play heavy minutes. Paschall played all but 4 seconds against Seton Hall and averages almost 36 minutes per game. Booth sat out 10 minutes Saturday because of first-half foul trouble and plays nearly 35 minutes a game. The rotation has senior guard Joe Cremo, a graduate transfer, and sophomore forward Dhamir Cosby-Roundtree coming off the bench, with starters Booth, Paschall, Bey, Collin Gillespie and Jermaine Samuels. So the question now is whether the Wildcats can come around in what should be a wide-open Big East tournament. They’ll work up to Thursday’s game seeking to resolve their inconsistency. And expect him to lean on Booth and Paschall even more. “I think Phil and Eric are going to become even more important in postseason, having had the experiences they have,” he said. “That is one thing, you can be a real talented team in the postseason, but in the NCAA Tournament, if you haven’t been there, it’s a whole different animal.